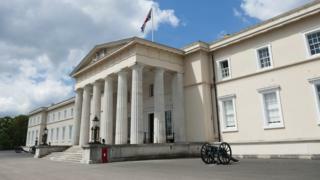 Two Army officer cadets have denied carrying out an assault at Sandhurst. Jonathan Cox, 25, and Edward Wright, 24, are accused of attacking Edward Flower at the Royal Military Academy in Berkshire. Both men, who are based at the academy's New College, pleaded not guilty to assault by beating. Assistant judge advocate Alistair McGrigor said a week-long trial would take place on 10 June at Bulford Military Court in Wiltshire. A case review was also listed to take place on April 29.